Sometimes, when a book (or a film) is accompanied by much hyperbole, the event itself can be a letdown; not so in the case of Mark Mayes’s exquisite debut novel, The Gift Maker. The book’s blurb is an accurate teaser of what you’re getting so I won’t regurgitate it here. Instead, I can say that it is a book rich in spiritual context, which drips symbolism and is utterly timeless. It’s hard to pinpoint the genre of this very original novel; it’s a quest, a journey, an adult fairy-tale and has more than a sprinkling of magic and stardust. However, it is a mercifully wizard-free zone, and some of it is a tough read – particularly the vividly repulsive descriptions of the border town of Grenze (think Patrick Suskind’s Perfume and you’re halfway there). The characters are compelling and the story is so multi-layered that just when you think you’ve got a handle of where it’s all going – the plot takes another unexpected turn. It’s a book about identity, vanity, ego and insecurity, and forces beyond our mortal flaws. For me the final chapter was a big reveal, but each reader will draw their own conclusions. 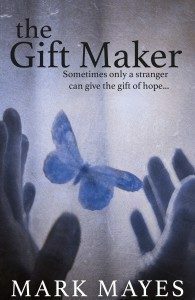 I feel richer for reading The Gift Maker – the poetic language alone was worth the journey.